Newsletter 12c_2006 » Happy New Year From Rumberos.ca greeting card..
Events Calendar » Maracatu Nunca Antes, Caché, New Year's Eve, Jaymz Bee's Tuesday Jazz Series, Folklore Urbano, and Discount Coupon. New Years Brazilian Style! @ Rio 40 Degrees » Live music with the electrifying band, Sambacana. Brazilian food and drinks. A night of true Brazilian revelry! e-news 06.12 » Alex Pangman And Her Alley Cats @ Lula Lounge, Waylen Miki Combo And 12 Jazz Vocalists @ Lula Lounge, Sophia Perlman And The Vipers @ The Rivoli and Massey Hall's 6th Annual Comedy Extravaganza. e-newsletter » Topics including November 29 slide show, December 23 Cross the Trax Xmas Hop, Michel Bérubé Christmas CD and FYFB Christmas appeal. Shareholder Alert » InterRent Completes Conversion to Real Estate Investment Trust. Chill this Christmas! » Inspired By Wine. Still Canada’s Most Trusted Wine Accessory and Wine Storage Provider. Newsletter 12_2006 » Showcase of Cuban music in Canada. e-newsletter » News and upcoming events for popular contemporary Jazz singer. Shareholder Alert » InterRent Announces Shareholder Approval of Plan of Arrangement With Silverstone Equities and REIT Conversion. Events Calendar » Hart Beats, Jaymz Bee's Tuesday Jazz Series, Adonis Puentes, Kollage, Alex Pangman, African Guitar Summit and Discount Coupon. 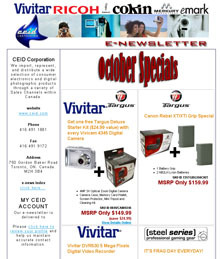 e-newsletter specials bulletin » English and French language versions of popular monthly publication. CEID Corporation imports, represents, and distributes a wide selection of consumer electronics and digital photographic products through a variety of Sales Channels within Canada. 4th anniversary invitation » Selected customer invitation to celebrate four years of service for Brazilian restaurant located in downtown Toronto. Item includes automated rsvp feature. e-news SPECIAL » A Gino Empry Tribute. November 22 2006 @ Mysteriously Yours Dinner Theatre. Public Relations And Media Release » Event synopsis and calendar w/ *.mp3 files for the print and entertainment media. e-newsletter » Topics including November 29 open house, December 23 Cross the Trax Xmas Hop, Michel Bérubé Christmas CD and FYFB donation, FYFB volunteer profile of Margaret Cantwell and Friends of FYFB monthly donation program. Special Announcement » Celebrate Your Holiday Party @ Lula! and Salsa weekend events. Newsletter 11_2006 » Showcase of Cuban music in Canada. Newsletter 06.11 » Tuesday Jazz at Lula Lounge, Gino Empry Tribute, Saturdays at Warehouse Grill, Sundays at Stones Place, JAZZ.FM91 fall fundraiser, and HOT Sunday Showcase -- a Monthly Musical Adventure with a Message -- @ the Rivoli Upstairs lounge. e-newsletter » Launch of new website and sophmore album, news and upcoming events for popular contemporary Jazz singer. Events Calendar » JAZZ.FM 91 Presents Dione Taylor CD release, Hallowe'en and Tuesday Jazz w/ Jaymz Bee, Gary Topp Presents James Hunter and Kobo Town/ Ray Montford CD Launch. Special Announcement » OCTOBER FEATURES: Hallowe'en Parties, CD Launches, and Salsa weekend events. Shareholder Alert » InterRent Receives Interim Order From Ontario Superior Court of Justice/ Special Shareholders Meeting. Shareholder Alert » InterRent Announces Purchase and Sale Transactions. Newsletter 06.10 » Big Rude Jake Trio performs live @ the Warehouse Grill, Gilda’s Club Greater Toronto 5th Anniversary cocktail reception, JAZZ.FM91 Open House, JAZZ.FM91 and FUSION III Distribution present New Standards (VOL. 1) CD Launch Party, Jaymz Bee and The Royal Jelly Orchestra HALLOWEEN JAZZ EXTRAVAGANZA @ Lula Lounge. e-newsletter » Formed in 2001 by the critically acclaimed Juno-Nominated jazz and blues vocalist Dione Taylor, and bassist/ bandleader Sandy Mamane, Soular has been laying down deep infectious grooves with soulful vocals and funky sounds. 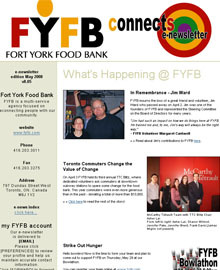 e-newsletter » FYFB is a multi-service agency focused on reconnecting people with our community. Publication includes recent news, "Did You Know??? ", and upcoming events. Events Calendar » Badi Assad, JAZZ.FM 91 Presents Dione Taylor CD release, Tuesday Jazz w/ Jaymz Bee, Gary Topp Presents Arthur Brown, and Gary Topp Presents James Hunter. e-newsletter » CEID Corporation imports, represents, and distributes a wide selection of consumer electronics and digital photographic products through a variety of Sales Channels within Canada. Special Announcement » SEPTEMBER FEATURES: Small World Music Festival, Kollage CD Launch, and Bryan Vargas y ¡ya Está! special invitation » email invitation to preview the Kim Dorland - New Paintings exhibition for selected guests of Angell Gallery. e-newsletter » Kim Dorland - New Paintings exhibition and Named Semi-Finalist for the RBC Canadian Painting Competition, Nick and Sheila Pye debut their new video work, Angell Gallery @ Nuit Blanche, Bradley Harms in The Globe and Mail, Artist News, Canadian Art Gallery Hop and Upcoming Exhibitions. Newsletter 06.09 » Marieve Herington CD release and Babes In Jazz Land @ LULA, Kollage CD Release @ LULA, TWO ARTISTS: Nash The Slash and Robert Vanderhorst @ The Gladstone Hotel, Elizabeth Shepherd "Start To Move" CD Release and Serafin. Public Relations And Media Release » Rob Curto’s Forró For All Together With Maracatu Nunca Antes At Lula Lounge, September 10th, 2006. Fall News & Events » Samba Toronto presents workshops, dance lessons and Bateria practice w/ Alan Heatherington at the Royal Conservatory of Music. Events Calendar » Friday concert series w/ Laura Ocampo and Badi Assad, Caribe Son, Small World Music Festival, Bryan Vargas, and Jazz @ Lula. Shareholder Alert » InterRent Announces Appointment of Gary V. Traer, BBM, CMA to Position of Chief Financial Officer. 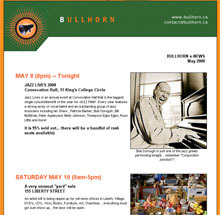 Newsletter 06.08 » Thursday’s At Stones Place, Marieve Herington CD release @ LULA, Kollage CD Release @ LULA, Chet Baker Jazz Festival, Markham Jazz Festival and the JAZZ.FM91 Sound of 2006/ 2007 Jazz Series. e-news release » CEID Corporation imports, represents, and distributes a wide selection of consumer electronics and digital photographic products through a variety of Sales Channels within Canada. Shareholder Alert » InterRent and Silverstone Equities Apartment Portfolio Valued at $102.09 Million by Independent Appraiser. Shareholder Alert » InterRent Releases Financial Operating Results for the Third Quarter and First Nine Months of 2006. Events Calendar » Kelly Lee Evans, Friday concert series w/ Eliana Cuevas, Amanda Martinez and Laura Ocampo, Bio Ritmo, Estonian Innovator Kirile Loo and discount coupon. Shareholder Alert » InterRent Announces 3rd Quarter Investor Conference Call. Newsletter 06.07 » Thursday’s At Stones Place, Zombies Love Kitties Too! (for the Toronto Cat Rescue), Markham Jazz Festival and other special events. Events Calendar » Small World Music Presents GLOBAL CAFE, Learie McNicolls' Underworld 7, Brazil/Cape Verde Night! w/ Luanda Jones, Guiomar Campbell's Parabolica and Carmen Souza, Kelly Lee Evans Returns To LULA, and August Friday concert series w/ Eliana Cuevas, Amanda Martinez and Laura Ocampo. Special Announcement » July 27 2006. Celebrating with jazz and Afro-Brazilian beats to help a rural school in Uganda -- VERAO VIBES -- Fundraiser for the Monayr Asha Aid Foundation. Shareholder Alert » InterRent Announces Agreements to Acquire 67 Suites in Kingston and Niagara Falls, Ontario for $3.86 Million. Public Relations And Media Release » Event synopsis and calendar for the print and entertainment media. e-newsletter SPECIAL » TIM RODA: The Globe and Mail Review. e-newsletter » Dolejs party pics, Tim Roda - New Works, Jakub Dolejš - Tribune exhibition review, Jakub Dolejš at The National Gallery, Kim Dorland at Howard House, Luke Painter in TRANSMEDIA :29:59 and Upcoming Exhibitions. 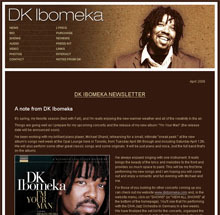 Newsletter 06.06 » DK IBOMEKA - DEBUT CD LAUNCH "LOVE STORIES", Thursday’s At Stones Place, Babes In Jazz Land CD Release, 40th Anniversary CHIN International Picnic, SARSical, Gold Ribbon Jazz Cruise, and Markham Jazz Festival. Events Calendar » Small World Music Presents Reza With John Densmore, Fathers Day Rumba: Afro-Cubana, Gary Topp presents GRUPO FANTASMA and Lula Lounge presents BOMBA! Shareholder Alert » InterRent Announces Completion of $2.285 Million Non-Brokered Private Placement. Wine In The Courtyard - Saturday June 17th 2006 w/ AboutFace » Fabulous Food, Champagne reception hosted by Moet, Live Wine Auction, Sampling Wines compliments of Jackson-Triggs, Robert Mondavi and Halpern Enterprises. Live Jazz with Juno Award Winner Bob DeAngelis. Events Calendar » Gary Topp presents Warsaw Village Band and the return of the Sun Ra Arkestra, Maryem Tollar, CBC Radio 99.1 presents: FLAMENCO CARAVAN, Nicolas Hernandez. e-newsletter » Kineko party pics, Jakub Dolejš - Tribune exhibition, Kineko Ivic News, Jakub Dolejš at The National Gallery, Nick and Sheila Pye in Chicago, Power Ball 8, artist news and Upcoming Exhibitions. Newsletter 05.06 » Toronto Launch Pad CD Release, Thursday’s At Stone’s Place and 40th Anniversary CHIN International Picnic. Shareholder Alert » InterRent Announces Signing of Letter of Intent To Acquire Sixty Suites In Prescott, Ontario For $2.7 Million. Special Tax News Edition. Government of Canada Budget Review And Analysis » Finance Minister Jim Flaherty tabled his 2006 Budget in Parliament on May 2, 2006. Budget Commentary is available for review. Shareholder Alert » InterRent Releases Financial Operating Results For The Second Quarter And First Half Of 2006. Special Announcement » Lula World 4 May 3-14 @ Lula Lounge. Celebrating 4 Years of Essential Music & Culture from Around the World. Shareholder Alert » InterRent Announces Private Placement. e-newsletter » New York Style exhibition and party pics, Kineko Ivic exhibition, Carte Blanche photography exhibition, Kim Dorland in Milan and the United States, and Upcoming Exhibitions. Events Calendar » Bio Ritmo Salsa Machine, Lady Son y Articulo Veinte, Lula World 4 and contest. DNAMuseLETTER » DNA5 nomination for best group at This Year's Canadian Smooth Jazz Awards!, Songwriter Café At The Red Guitar, pre production has begun for "The Rose Tattoo", "Something Like Ceramic" - recent review by Stanley Fefferman, upcoming performances and DNAMuseNEWS. Public Relations And Media Release » Special cocktail and canapé reception for media to meet the performers of Lula World 4 -- Celebrating 4 Years of Essential Music & Culture from Around the World. Special Tax News Edition. Province of Ontario Budget Review And Analysis » Ontario Finance Minister Dwight Duncan tabled his 2006 Budget in the Legislature on March 23, 2006. Budget Commentary is available for review. @ The Wine And Cheese Show March 24-26, 2006 » The Toronto Wine & Cheese Show is Canada’s Premier Gourmet Event. 2006 will mark The Wine Establishment's 20th year as a participant. Newsletter 03.06 » Serafin w/ Babes In Jazzland, Michele Mele, Helmut Lipsky/ Mora Sexted, Luis Mario Ochoa and Sunday Vocal Jazz Series. Events Calendar » Cuban Fridays, D'BI Young Book Launch, Gary Topp Presents Helmut Lipsky, Audience and Blowfly, and contest. e-newsletter » Stephen Ibbott exhibition and party pics, New York Style exhibition, Kim Dorland at ~scopeNewYork, The Globe & Mail's Leanne Delap Interviews Jamie Angell, Jason Gringler - Canadian Art review, Steven Ibbott press, Upcoming shows for Luke Painter and Jakub Dolejs, and Upcoming Exhibitions. Shareholder Alert » InterRent Announces Signing of Binding Letter Of Intent To Combine With Silverstone Equities; Followed By Anticipated REIT Conversion. e- News Update » Jaymz Bee's Annual Oscar Party Serafin CD Launch w/ Babes In Jazzland, Michele Mele, and Sunday Vocal Jazz Series. Winter 2006 » Income Splitting - Opportunities to Reduce Income Tax, Canadian Dollar - What's in Store for 2006?, Financial Performance Management: It Starts at the Top, DMCT & AKCESSIA clients looking for buyers and sellers in certain industries, and recent transactions Tombstone. Warehouse & Showroom Sale » Everything in Showroom and Warehouse on Sale. Great Stuff Great Prices Exclusive Brands. Shareholder Alert » InterRent Announces Agreement To Acquire 63 Suite Hamilton Apartment Building. Newsletter 02.06 » Serafin CD Launch, Babes In Jazzland, A View From The Gallery(Nash The Slash and surrealist painter Robert Vanderhorst), Alex Pangman And Colonel Tom Parker, Michele Mele, and Sunday Vocal Jazz Series. DNAMuseLETTER » Daniela Nardi And DNA5 La Viva Domenica show, Songwriter Soiree @ The Red Guitar, nomination for best group at This Year's Canadian Smooth Jazz Awards! and DNAMuseNEWS. Shareholder Alert » InterRent Announces Closing Of Largest Acquisition To Date And Sale Of GTA Property. e-news TAX ALERT » The Katrina Emergency Tax Relief Act and Charitable Contributions. e-newsletter » Angell '10' exhibition and party pics, Stephen Ibbott "Love In Digital Times" exhibition, Kim Dorland at ~scopeNewYork, Geoffrey Pugen @ the Untitled Art Awards, Artist News, Upcoming Exhibitions. e-newsletter launch » Inaugural quarterly e-newsletter with articles about E-filing Tax Returns, New Jersey tax developments, and firm news. Shareholder Alert » InterRent Reports Revenue Increase of 199% For First Quarter Of 2006. Events Calendar » Cuban Fridays, Gryhon Trio, Lura, Priya Thomas, Kobotown And Kelly Lee Evans, Gary Topp Presents, LULAWORLD Call For Submissions and contest. Newsletter 01.06 » Luis Mario Ochoa & Cimarrón CD Launch, Lori Cullen CD Launch, Monkey Toast w/ Nash The Slash, Babes In Jazzland, and Toronto Launch Pad. Shareholder Alert » InterRent Consolidates Property Management Operations With Adelaide Development Corp..
e-newsletter » New WebSite Launch. Quote of the Month, Angell '10', Kim Dorland at ~scopeMiami, Canadian Department of Foreign Affairs Reception, Artist News, Upcoming Exhibitions. DNAMuseLETTER » Daniela Nardi And DNA5 Nominated For Best Group At This Year's Canadian Smooth Jazz Awards! and DNAMuseNEWS. Shareholder Alert » InterRent Announces $24.8 Million Portfolio Value Growth For 2005.